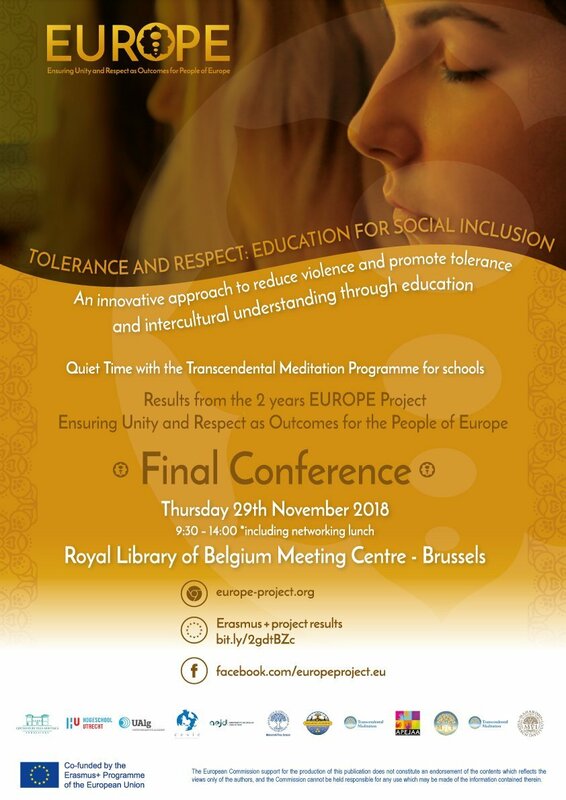 The final EUROPE conference will present the key results from the EUROPE project, that has been implementing and exploring the benefits of an innovative approach across 3 EU Member States (Portugal, the Netherlands and Sweden) to prevent violence and radicalization and promote social inclusion and integration through education: the Quiet Time with Transcendental Meditation Programme for schools (QT/TMP). The overall conceptual framework of the project will be presented as an innovative approach to tackle the root cause of violence and to promote tolerance, respect and understanding among people with different ethnic or religious backgrounds, together with how the project can support teachers and educators in dealing with diversity, so as to help children and young people to become responsible and open-minded members of our diverse society. Scientific research results will be presented from studies conducted at each implementation site together with a comparison of results from participating countries for bringing it up on a wider European level. During the conference, the schools involved in the project from the different countries will share their experiences of implementing the programme. In addition to introducing the outcomes of the project, this half-day conference will allow further networking, engaging EUROPE project experts, researchers, partners and schools with interested policy-makers and stakeholders. Opportunities will be provided to discuss research results and conclusions as well as policy recommendations.